Are You Planning to Work Until 67? And Will You Be Able To? If you were born in 1960 or later, you'll have to wait until age 67 to get your full retirement benefit from Social Security -- based on the rules as they stand today. If you love what you do, are capable of continuing it, and your employer still finds the work you deliver valuable, then more power to you. However, counting on keeping your job until 67 carries risks -- risks you must consider when making long-term plans. 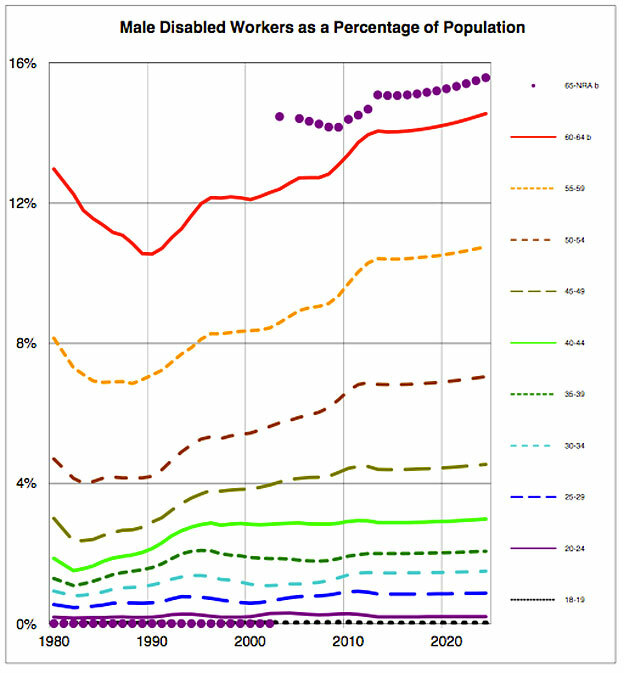 The chart below shows the labor force participation rate in 2012 (the most recent data available), based on data from the Bureau of Labor Statistics. It essentially shows the percentage of people in each age bracket actively working or looking for work . As you can see, the participation rate starts dropping after around the mid-40s, with significant declines starting around 55. 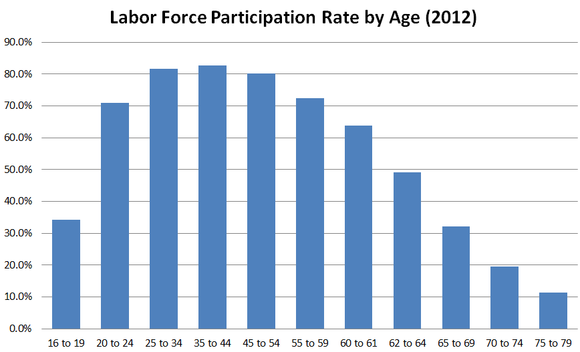 It drops below 50 percent for 62 to 64, and in the 65 to 69 age bracket, the participation rate had fallen to 32.1 percent. A major risk to your plan is that you might wind up disabled. 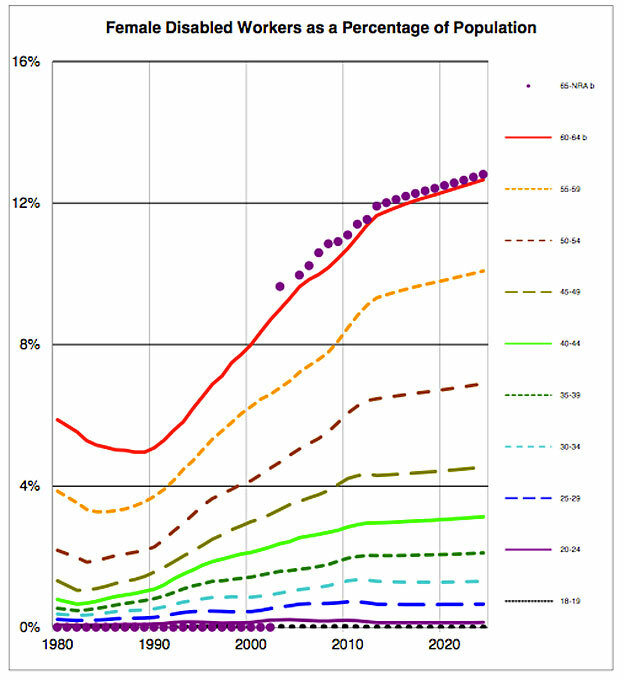 The charts below come from the U.S. Congressional Budget Office and show disabled workers as a percentage of the overall population, by gender and age group. Age 60-64 is represented by the red line; note how it's substantially higher than most of the others. Indeed, it's only beaten by the purple dots, which represent the disability rate for those ages 65 and up who haven't yet reached their full Social Security retirement age. Even if your mental and physical health hold up, there's no guarantee that your employer will be around until you reach your planned retirement age, nor that the company will need your services if it does. Look around your office and estimate the ages of your co-workers. How many are in their late 50s or 60s? Of those who are, how many are doing the type of work you're doing now, or have a decent shot of being able to? In addition, once you hit your 50s, it starts to get more difficult to find a new job that pays well and provides meaningful work. Oh sure, if you're a proven executive with incredibly strong leadership skills, you may be able to land on your feet at any age, but for the rest of us, a longresume may start becoming a liability. If there's any risk that you won't be in your current job until you're ready to retire, the first and most important thing you can do is to save and invest as though your retirement date will come well before you reach 67. Even if you intend to keep working, money brings flexibility, including the flexibility to either retire early on your terms or to survive and thrive in a lower-paying job, should you lose the job you're in. On top of that, with a strong enough personal financial position, you can buy yourself a job by starting or investing in a small business that needs both capital and leadership, or by buying a franchise. If you want and are able to work until age 67 (or beyond), charting your own course like that may provide you better opportunities than hunting for traditional jobs when you're in your 50s and 60s. But you'll need to have capital to work with. On the positive side, the experience and reputation that come with age will always matter for some jobs. 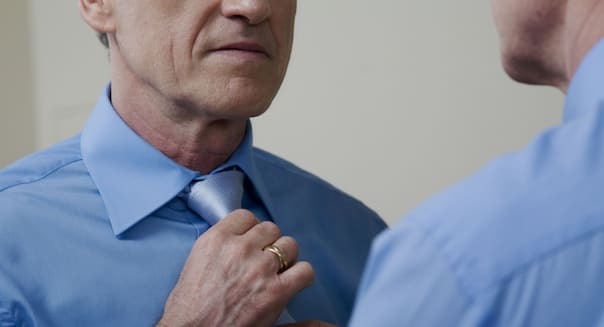 For instance, nonprofits often need help and love the reliability, trustworthiness and solid reputation that often come along with gray hair (or no hair). A good reputation means a lot to a charity, and that's one characteristic you ought to be able to play up in your 50s and beyond. Chuck Saletta is a Motley Fool contributor. Scottsdale is a retirement mecca, with a reasonable cost of living, state and local taxes well below the national average, a great quality of life and plenty of amenities. But housing costs are nearly double the national average. Winters are warm, but summers are sizzling hot. Peak temperatures can reach close to 120 degrees -- after all, it's in the desert. The locals will dismiss it as "dry heat," but that kind of heat will still send your electric bill for air conditioning soaring, and can necessitate you buying new cars more frequently than you'd like. Key West offers Caribbean weather in the U.S., an attribute that makes it a natural choice for retirees. And who could resist the Jimmy Buffett-Parrot Head thing, especially once you're living a life of leisure? You might be better off if you resist. The cost of living is 30 percent higher than the U.S. average, and housing costs at least twice as much. Travel is another issue. Key West is the most remote location in the continental U.S. The only road off the 6-square-mile island is the Overseas Highway, a 127.5-mile causeway that is largely one lane in each direction. Hurricanes -- all too common in Florida -- are rare in Key West -- though Wilma did hit it in 2005. But when they do impact the island, though, it's worth noting that the city has the Atlantic Ocean on one side and the Gulf of Mexico on the other, and there's no part of it that's more than 18 feet above sea level. So homeowners must pay several thousand dollars a year for hurricane insurance. As big California cities go, San Diego is a bargain. But compared to the rest of the country, San Diego is certified high-cost. Yes, the weather is near perfect year-round. But the cost of living is one-third higher than the rest of the country, and house prices are nearly 2½ times the national average. Add in California's high state and local tax rates and the earthquake issue, and San Diego should be crossed off your list of potential retirement cities. Traffic congestion -- Second worst gridlock in U.S.
Can you imagine a more idyllic place to retire than Honolulu? Probably not. But as beautiful as it is, it shares many of the financial strains common to other cities on this list, plus a few more. The overall cost of living is second only to New York City. After all, most of the goods people need have to be shipped across thousands of miles of ocean. The state tax burden is only slightly higher than the national average, but the median house price is triple the national average. Finally, as far as cost of living is concerned, Honolulu has an unusual financial issue: travel expenses. Sooner or later, you'll want to get away from Hawaii. And there's no cheap way to escape from this paradise. Traffic congestion -- Third worst gridlock in U.S.
San Francisco frequently makes those "favorite cities in America" lists and for good reason. Situated on a peninsula between the Pacific Ocean and the San Francisco Bay, it is one of the most scenic cities in the world. Mild weather year-round, world class cuisine, charming neighborhoods and an eclectic population make it one of the most desirable places to live anywhere in the world. But it has the highest median house prices in the country, which should scare off retirees. Its cost of living trails only New York City and Honolulu. And like the rest of California, its state and local tax burden is second only to New York. One other reason people might avoid living in San Francisco is that it's prone to earthquakes. While that's certainly a concern for personal safety, few people from non-earthquake prone areas realize how it increases your cost of living. Homeowners need to pay several thousand dollars per year for earthquake insurance. Traffic congestion -- 10th worst gridlock in U.S.
Washington is centrally located, is filled with historic attractions and has some of the most beautiful neighborhoods in the country. It also has one of the highest effective local income tax rates in the country. The district taxes the first $10,000 of income at 4 percent, then 6 percent to $40,000, then 8.5 percent on all income over $40,000 (you can exempt up to $3,000 in retirement income). Like other cities on this list, Washington sports a high cost of living and some of the highest housing prices in the country. The area also has its share of toll roads, and traffic is a recurring problem. This is especially troublesome during the holidays and summer months. Interstate 95 -- which bisects the metro area -- is the principal travel corridor between the Northeast and Florida. Making traffic matters worse: the near-permanent road construction projects. Traffic congestion -- Worst gridlock in U.S.
As recently as the 1970s, Los Angeles was widely viewed as the city that all America was looking to move to -- or at least to imitate. Perfect weather, endless beaches, palm tree-lined streets, plentiful housing, a powerhouse economy and the lure of rubbing elbows with a celebrity or two. Today, about the only things L.A. has going for it are near-perfect weather and In-N-Out Burger. The rest is mostly a faded memory. The city's success was, in fact, a key contributor to its decline: The near-doubling of the metro population since the 1970s has created East Coast levels of human congestion. Property values are higher than New York's and nearly twice those of Chicago. The state and local tax burden in California is second only to New York, and the overall cost of living in L.A. is more than one-third higher than the national average. California's unfunded pension liabilities are nearly as high as those in Illinois, threatening serious tax increases that could squeeze retirees. Nagging quality of life issues include the worst traffic congestion in the nation and smog that could lead to higher medical costs. Traffic congestion -- Ninth worst gridlock in U.S.
Boston is the quaintest large city in America, sporting centuries-old but impeccably maintained architecture, neighborhoods and surrounding communities that just ooze with charm and close access to the beaches of Cape Cod and the mountains of Vermont and New Hampshire. If Boston were a less expensive place to live, it could well be an popular and smart retirement destination. But it isn't. The high cost of living and high housing prices are the main reasons cited by former residents for leaving the state. The state tax burden is higher than the national average; the cost of living is about one-third higher than the national average; and house prices are nearly double the U.S. median. Translation: a large chunk of your retirement income would be spent just covering basic living expenses. Based on the numbers, Chicago wouldn't seem to be the retirement financial disaster that other cities on this list are. The state tax burden is only slightly higher than the national average; the cost of living is tolerably higher than the U.S. average; and house prices -- while higher than the nation in general -- are downright affordable compared to the coastal cities. However, in addition to being a generally more expensive place to live than the nation at large, the area faces burgeoning problems just over the horizon. Illinois faces the highest unfunded pension obligations of any other state in the country, at around $100 billion. Chicago faces a nation-leading $20 billion unfunded pension liability. Such deficits scream out for higher taxes across the board. We can only speculate as to which taxes will be raised (or created). Traffic congestion -- Fifth worst gridlock in U.S. The area has fantastic amenities -– theater, music, concerts, festivals, ethnic foods, diverse and quaint neighborhoods and close access to beaches and mountains. It also has probably the most comprehensive public transportation system in the U.S. But it breaks down spectacularly when it comes to the costs. The area has close to the highest cost of living in the country, which gets markedly worse the closer you are to Manhattan. House prices are out of sight, particularly in the more desirable communities and neighborhoods. New York State has the highest state and local tax burden in the country. New Jersey has the highest real estate tax burden in the country. And nearby Connecticut isn't much better. Weather runs from winter-time deep freezes to protracted summer heat waves. The preponderance of bridges, tunnels and their tolls -- as well as antiquated roads running through quaint town centers -- makes congestion a constant problem, even on the weekends.